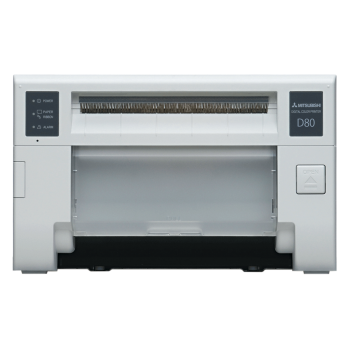 The latest addition to Mitsubishi Electric’s line of dye-sub printers, CP-D80DW, completes a full line of rewindable printers that are capable of letting users print all sizes of 6” photos from 2-2×6” to 6×8” from a single type of media. Widens your print offering without the challenges of swapping paper rolls, and keeping stock of multiple types of media! The CP-D80DW is also designed with space in mind, both from the printer’s footprint, and also from your perspective of having to so stock less types of media! 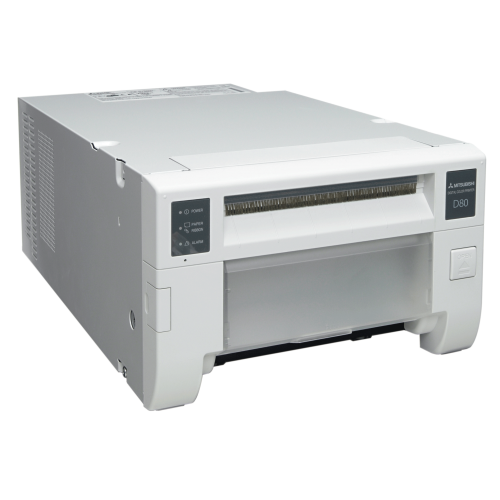 It has the capability to produce FOUR different print sizes from a single media and can print 2-2×6, 4×6, 6×6, and 6×8 prints from the very same roll of media. When other brands produce 4×6 prints from a 6×8 ink ribbon media, a half portion of the ink is wasted. But with the CP-D80DW’s “rewind” technology, when only one 4×6 photo printed, the donor ink ribbon is quickly rolled back to the last unused 4×6 half of the ribbon to avoid wasting it. Fast Print Speed – Approx. 7.8 sec. based on printing 2 – 4×6 prints using a 6×8 media. PC and MAC Printer – Compatible with most popular operating systems in Windows and MAC computers. 4 x 6'' - Approx. 7.8 sec. 5 x 7'' - Approx. 13.2 sec. 6 x 8'' - Approx. 14.6 sec.